I took a road trip to Eugene this afternoon and came back with a sweet 1969 Raleigh Competition. This bike and I will both be celebrating our 50th year next year. One of us is going to get a makeover! The Reynolds decal on the seat tube says 531 "frame tubes" but this decal agrees with the catalog that it's all 531. I was meaning to post that on the "are you looking" page. That was a great deal. What was it? $300? $350 -- still a pretty decent deal, I think. Have you met the guy that was selling it? He's got some pretty nice bikes in his back room. I hadn't seen the bike before the Craigslist ad, so I don't know the seller... who knows, perhaps we've encountered somewhere. I don't know of any C&V specific groups here in Eugene, although I suppose there were several steel bikes on the one Eugene Gears ride I went on a year ago. A Huret Jubilee would be sweet on that. Nice find and great price. I was just reading an old thread asking why there is so much Simplex Prestige bashing. A few people defended them. To be honest, I have a pair of these on my parts shelf, but I've never ridden with one because even on my Clunker 100 Challenge bike I decided to go with something else. I think maybe I'll try them on this bike before judging them anymore than I already have. 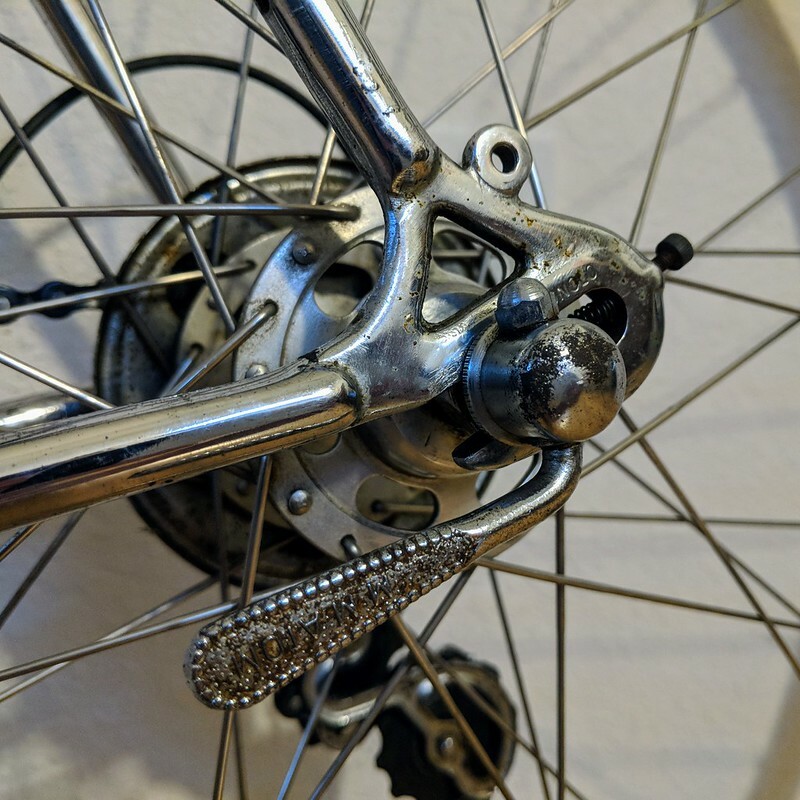 I think I've seen the question about Campy threading come up before and the answer was that all Campy dropouts are Campy threaded. I guess I'll find out soon enough. I don't want to volunteer his personal information publicly, but I'll send you a PM about where you can find him. We C&V types need to network. I wonder if that means that Campy hanger has French threads. I couldn't rest not having resolved a question so easily answered by experiment. The dropout does indeed have standard threading, but the derailleur doesn't use those threads. 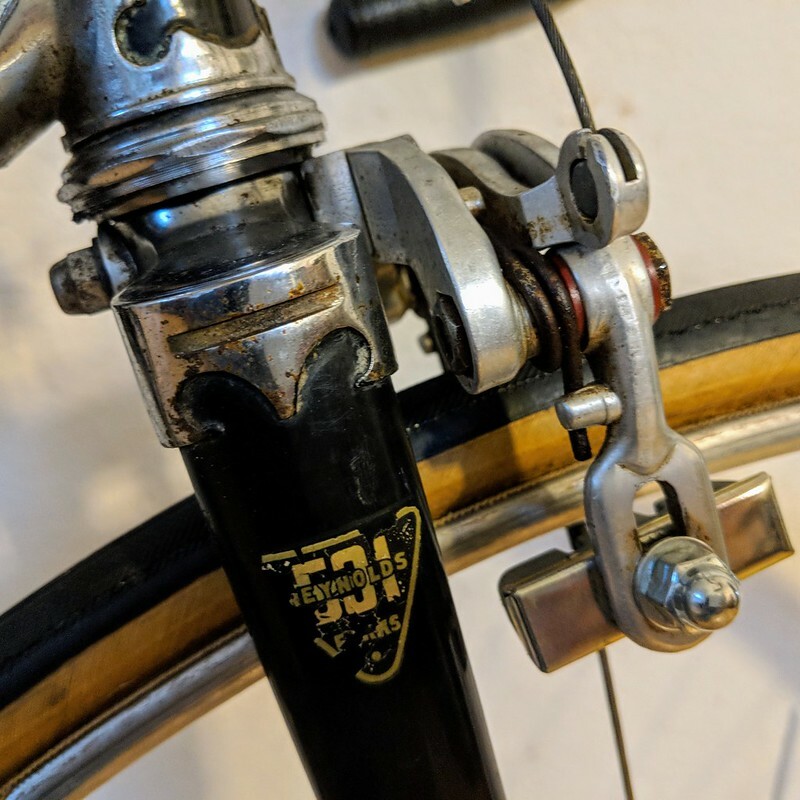 Instead, there's a small bolt that goes through the derailleur hanger from the wheel side and threads into the derailleur. 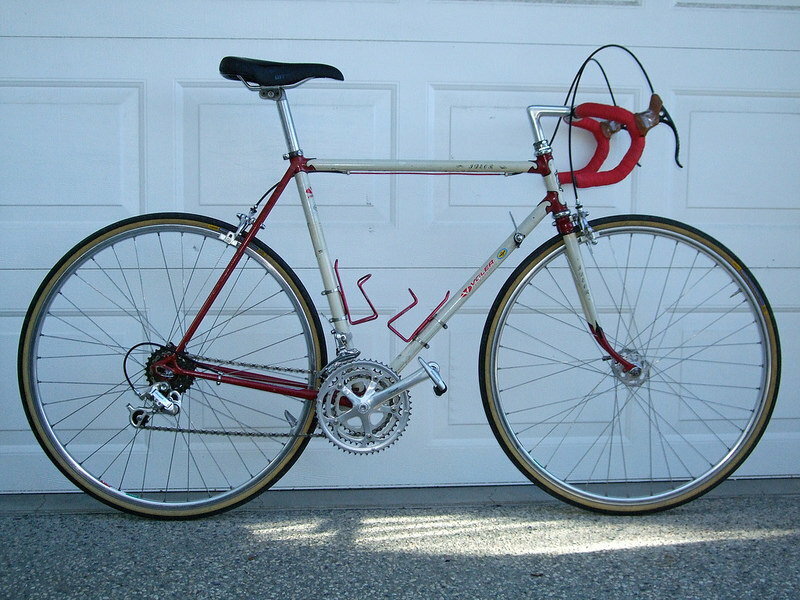 I was thinking what’s the big deal about a late 80’s bike? I had you pegged for 30. I see you have drunk the Gugie-ade. Cool bike, enjoy! You scored! (But I would change out that Simplex before it self destructed and took other stuff with it. I wonder if that means that Campy hanger has French threads. 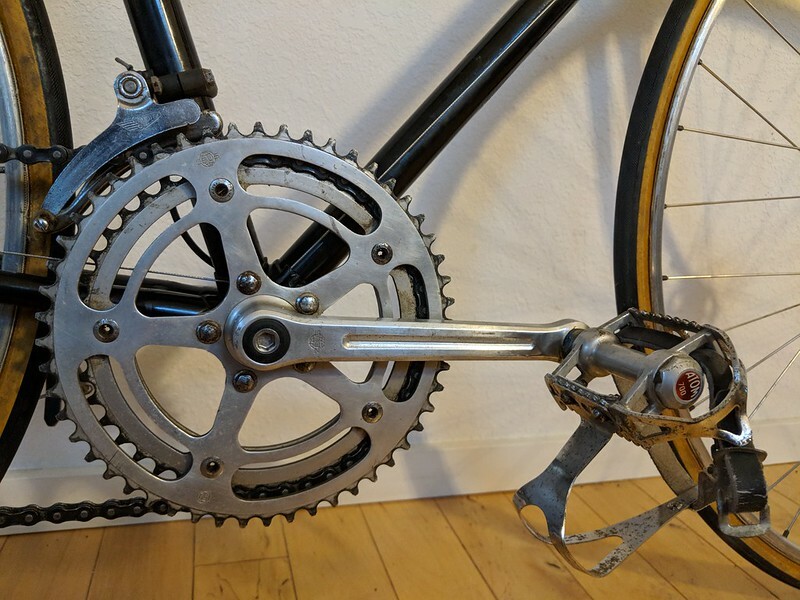 No, Simplex derailleurs don't engage the threads in the hanger at all; they use a bolt that threads into the derailleur from the back side of the hanger. Guilty. I actually took it by the Atelier to discuss possible plans before I even brought it home. Your rear wheel qr is a disaster waiting to happen. The lever should be on top facing rearward. I dont get it. Never gave any thought as to QRs orientation as long as they are closed tight. I've run mine facing the same as the picture for over 50 years. Never had an issue. Explain? He didn't go home first, drove straight from Eugene to me. Wrong. I suggest you check The Rules. This is clearly not a time trial machine. I would suggest that Andy's sin is menial, a small rotation is all that's required. Congratulations, and happy early birthday! 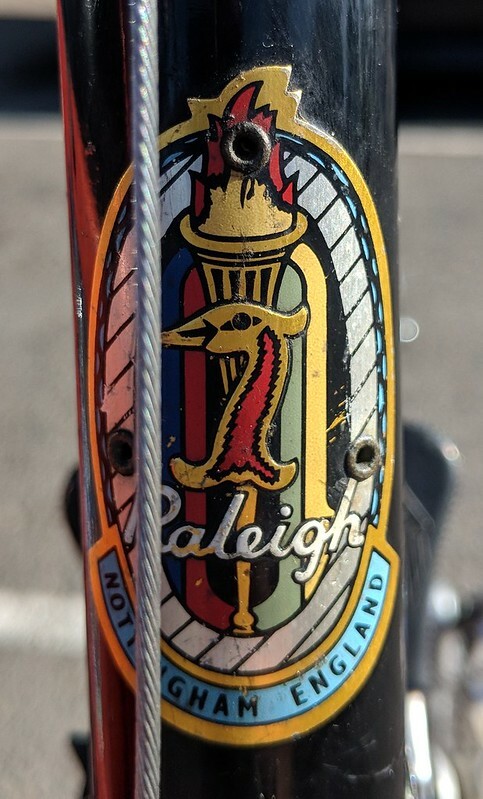 That Raleigh has been posted for sale for quite some time! Each time scrolling through Craigslist, I’d pause, and admire it, always trying to justify checking it out myself, but it’s just too tall a frame for me. 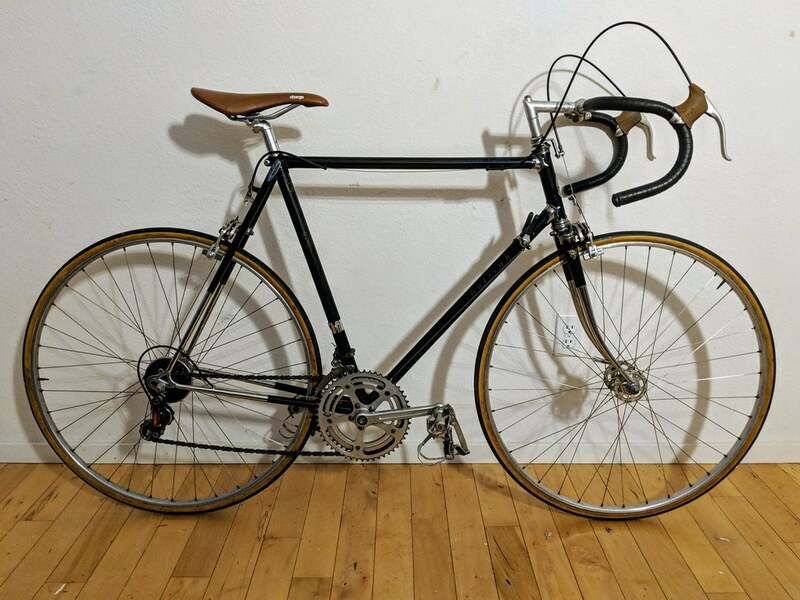 The seller posted some decent enough pics of the the bike (the footbridge over the Willamette was a nice placement), but it’s great to see your own detailed close ups. What a gorgeous bike! It’s been waiting very patiently for its new rider! I wouldn't change the derailleur/shifter set, they've lasted 50 years already. They're the OEM items for the 1969 Competition. 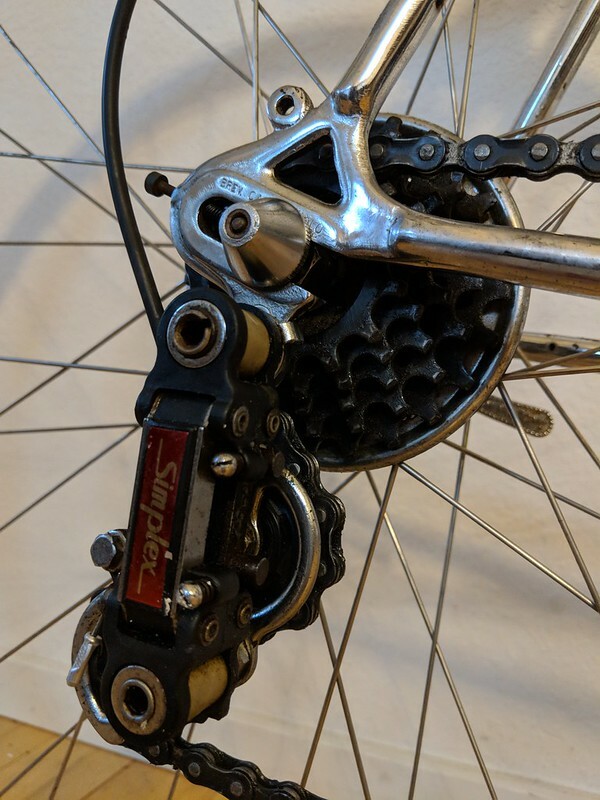 The parts being original does have a very strong appeal, but I've got to tell you that just playing around with it a bit last night to set the limit screws for a different freewheel I felt like I was going to break the shifters. Those things flex like nobody's business. Even so, I'll probably use them until they break and then replace them with something from SunTour. That's period-correct procedure, right? 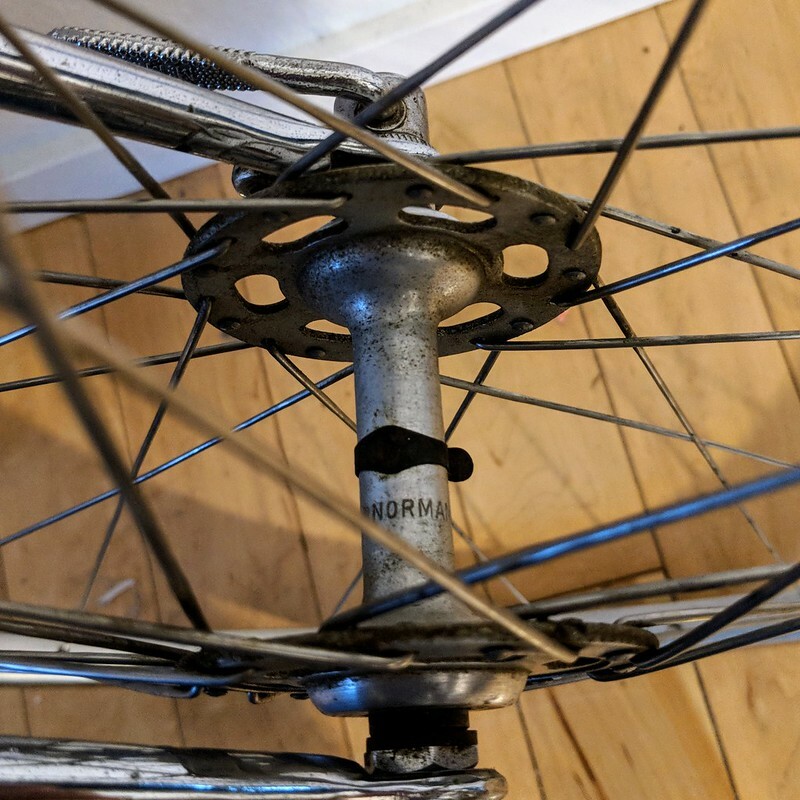 Andy, I dumped too many Simplex derailleurs into the spokes of my UO-8 to want to see anybody riding them on a bike that sweet. You'll probably see a bent dropout and scraped chainstay plus whatever happens to the wheel. Granted I was a teenager and not yet well indoctrinated to derailleur bikes, Still, my woes have been duplicated many times over by others. 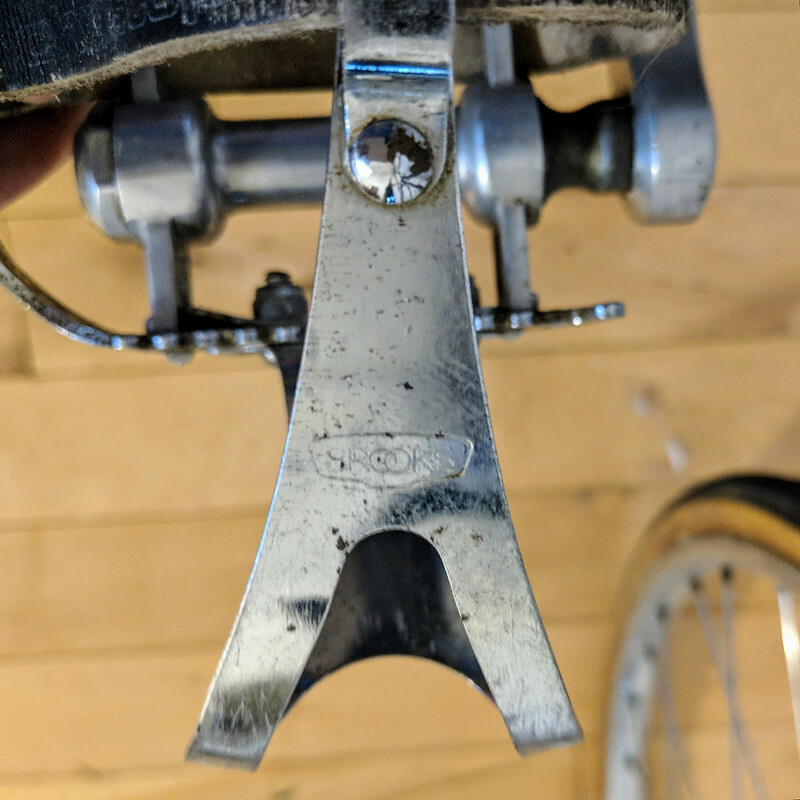 That smaller bolt through the Campy hanger sounds at least as marginal as the plate add-on derailleur hanger of my UO-8. I'd never be able to trust that bad things weren't going to happen when I reached for that low gear. The fact that the Delrind plastic has been on a bike the whole 50 years doesn't impress me either. NOS in an unopened box -maybe. Great find, a beauty! '69 and '70 were the only years to have the chromed lugs and Olympic headbadge as far as I know. I have a 1970 that's been disassembled and waiting for awhile now, other bikes sort of happened after I got it and I kept dithering on a full strip and respray. But this winter it finally gets its turn and it will keep its original paint. The decals have faded to barely visible, replacements may be going on. Unlike yours, my bike is younger than I am. Last edited by PilotFishBob; 09-24-18 at 11:45 AM. Reason: removed redundancy. My Sports and I are about to turn 60. 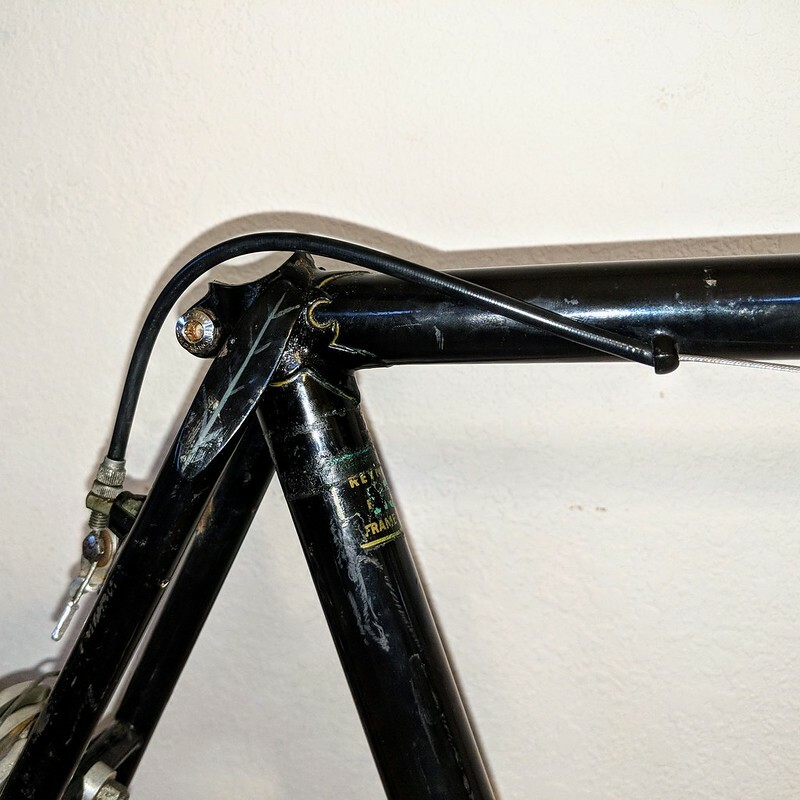 The flexy-lever problem seems to always resolve as a problem with the cabling or sticky derailer. I find that a properly set-up Simplex Prestige setup requires only fingertip pressure to shift, so lever flex isn't noticeable at all. Often it has just been that the low-limit screw had been cautiously over-tightened. The same applies to other oft-maligned derailers like the Allvit, where a verified-as-free-moving mechanism joined to lubricated shift levers/pivots with smooth, lined housings is more like the epitomy of light, smooth action, even after being modded to handle a standard 6-speed freewheel! Point being that we mustn't judge old bikes and components in their as-found, neglected state. 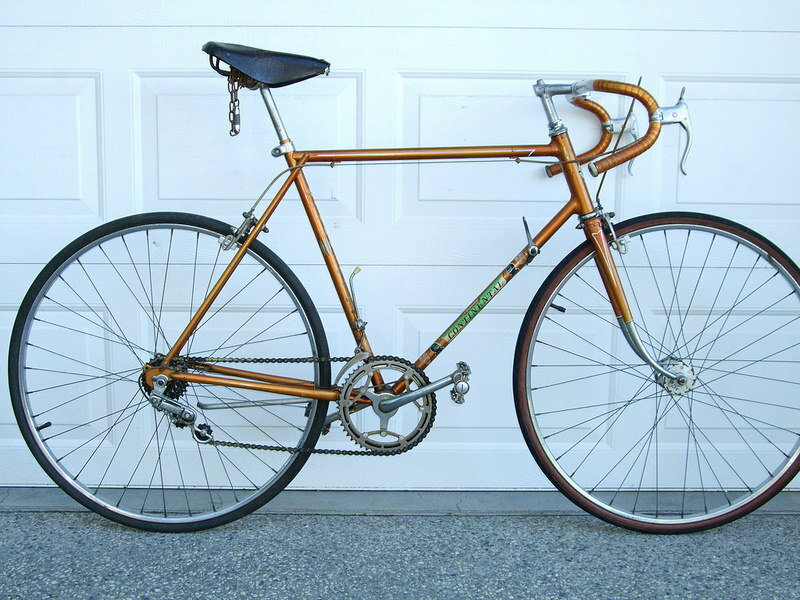 To the OP, congrat's on your fine Raleigh purchase! It's been a good year for finding long-sought models that never seemed to appear. 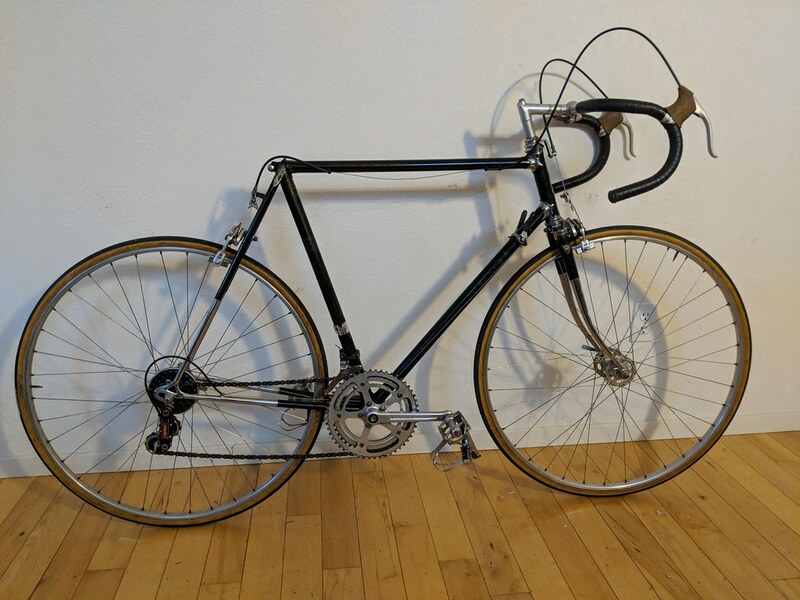 I very recently bought my birth-year bike locally, a well-maintained (though repainted and with many newer components) 1960 Ideor. This only a few months after also finding a 1960 Continental in my preferred 24" size. The Ideor is up and running, the Continental is still awaiting it's off-season rebuild.